According to the Fatality Analysis Reporting System, the proportion of fatal crashes at unsignalized rural intersections constitutes approximately 37 percent of all fatal crashes at intersections nationwide. (1) About 90 percent of these rural unsignalized intersection crashes occur on two-lane roads. As a low-cost remedy to address crashes at unsignalized intersections on two-lane rural roads, the Federal Highway Administration (FHWA) developed and evaluated a treatment to reduce approach speeds by narrowing lanes using rumble strips in the median and on the right-lane edge. This narrowing was applied for about 150 ft on the major road approach of two-way stop-controlled (TWSC) intersections on high-speed rural roads. Eight experimental sites were retrofitted between 2007 and 2008 in Missouri, Kentucky, Pennsylvania, Florida, and Maryland. Following the acquisition of at least 2 years of post-implementation crash data, pre- and post-implementation crash analysis was conducted to compare the performance of the new treatments. Results showed a 32 percent reduction in total crashes and a 34 percent reduction in fatal/injury crashes. In 2008, 22 percent of the 34,017 total fatal crashes in the United States (7,421) were intersection or intersection-related. Considering the 1,630,000 injury crashes that occurred in 2008, 45 percent of these (733,000) were intersection and intersection-related crashes. From the fatal injury crashes in 2008, 37 percent occurred at unsignalized rural intersections. Figure 1. Photo. 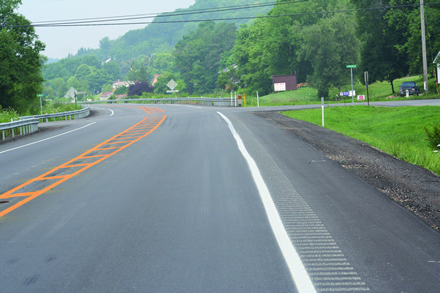 Lane narrowing using rumble strips at a rural Pennsylvania site. Crash data for this study were collected from intersections where the treatment was introduced several years before implementation and at least 2 years after implementation (the number of pre- and post-implementation years differed according to site). These pre- and post-treatment crash data were then compared to determine whether there was a significant difference and to estimate the magnitude of any treatment effects. The data were analyzed using an empirical Bayes (EB) analysis, which is the preferred method for examining these types of comparisons. The preliminary study indicated that the treatment sites experienced, on average, an 85 percent speed reduction of 4.5 mi/h for all vehicles and 4.8 mi/h for trucks. In figure 2, speed reductions were measured at points 2 and 4. Figure 2. Illustration. Speed data collection points. The main feature of this safety treatment is to narrow lanes by applying rumble strips. A design template that was used in field applications is shown in figure 3. A median island is formed by pavement markings in conjunction with rumble strips placed between the two travel lanes of the major road. 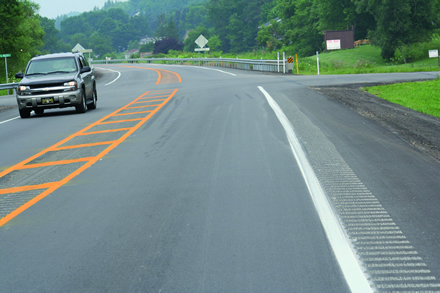 Rumble strips are also applied on the right side within the existing pavement width in the shoulder, as shown in figure 4. Rumble strips reduce the smooth travel lane widths on the major approaches for about 150 ft before and after the intersection and encourage drivers to slow down as they reach the intersection. Field applications in Pennsylvania cost between $50,000 and $70,000, while other States are much less expensive. Data from other States show that the implementation of the treatment costs between $10,000 and $30,000, excluding construction costs unrelated to the treatment. Figure 3. Illustration. Typical design used in the field. Figure 4. Illustration. Typical rumble strip design. Figure 3 shows that the major road lane is reduced from 12 to 9 ft measured from the inside edge of the pavement markings. 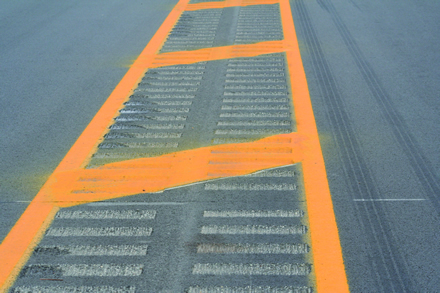 Edge markings could be placed on the edge of the rumble strips or directly on the strips. In most applications, the effective lane width is 10 ft when measured from the inside edges of the rumble strip. Three distinct regions are created when this treatment is applied—labeled as sections A, B, and C in figure 3. It is important to note that drivers are warned of the upcoming narrow lane area through signs placed at the beginning of section A. Section B is called the taper section, which is where the lane narrowing begins. The median width in section B starts at 0 ft and increases to the full width, which is typically 4–6 ft. Table 1 provides an estimate of the length of each section based on speed limit. Table 1. Section lengths for various speeds. 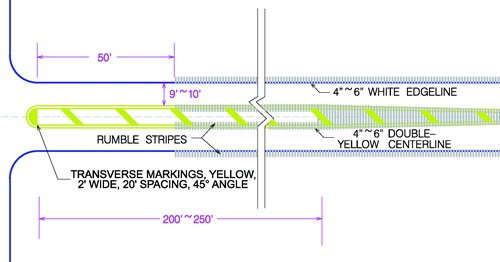 In figure 3, the median and shoulders are installed with milled rumble strips. The strips are present throughout section B and end in section C 50 ft before the intersection. 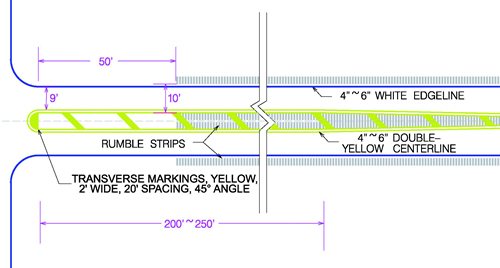 Two rows of rumble strips may be necessary to cover the median area (see figure 5). Rumble strips are not applied for the last 50 ft so that vehicles will not be forced to travel on the rumble strips while turning. The edge rumble strips start 50 ft before section B and continue throughout sections B and C. The application of rumble strips is shown in figure 3. Figure 5. Photo. Two rows of rumble strips in the median. Detection of the upcoming intersection was difficult for approaching drivers. Speeding was identified as a problem at the intersection (measured speeds exceeded the established criteria, and crash patterns indicated speed-related causes). Noncompliance at stop signs was frequently observed at the intersection. Most agencies responded favorably, and the treatments were applied at eight sites in five States. The intersection sites were chosen by the participating agencies based on typical stop control on the minor road with high crash frequencies and on the availability of data. Of the eight sites selected, seven are TWSC intersections, and one is a T-intersection. The site details are shown in table 2. One way to estimate the safety impact of a treatment is to compare pre- and post-treatment crash frequencies and also to compare these data with historical data from reference groups that received no treatment. For the purpose of this evaluation, pre-treatment crash data were collected for 3–5 years, and post-treatment data were collected for 2–3 years depending on the site. Due to the short data collection periods and the small sample size (eight sites), the safety of the treated intersections could not be determined with sufficient certainty based on site-specific crash data alone. However, to increase the precision of the safety estimates, the EB method was used. The method increased the precision of estimates by correcting for the regression-to-the-mean bias common to certain other inferential methods. The EB method compared the selected intersections with other similar intersections using a safety performance function (SPF). The SPFs were regression models for estimating the predicted average crash frequency of individual roadway sections or intersections. (3) The SPFs used in this study were developed from observed crash data of a set of similar sites. Crash data from 2001 to 2009 were collected for most of the intersections. At least 3 years of pre-treatment data and 2 years of post-treatment data were collected for all intersections. For several intersection sites, 5 years of pre-treatment data were collected. Average annual daily traffic (AADT) was also collected for application of the EB method. The crash data were provided by the participating State highway agencies (see table 3). Note that for all eight intersections, there were less post-treatment period crashes than pre-treatment period crashes per year. Table 3. Site data distributed over collection years. Note: The gray shading indicates pre-treatment data, and the red shading indicates post-treatment data. Blank cells denote years for which crash data was not available. The split cells represent a more accurate date of retrofitting. If AADT data were available for only a single year, that same value was applied to all years of the pre-treatment period. If 2+ years of AADT data were available, the AADTs for the intervening years were computed using interpolation. The AADTs for years prior to the first year for which data were available were assumed to be equivalent to the AADT for that first year. The AADTs for years following the last year for which data were available were assumed to be equivalent to the last year. The intersection angle for all intersections is 90 degrees, and all intersections are on two-lane roads. Also, the same number of lanes and the same intersection angles are common to most intersections. Only one intersection, which is located in Kentucky, has a left-turn lane that is accounted for in the calculations. The lane width varies from State to State because of the different application techniques that are used. Furthermore, lane widths differ from one point to the next due to limited accuracy in pavement marking and milling techniques. Table 4 shows the lane widths in the States where the treatment was applied. Table 4. Lane widths at various sites. A description of the EB method used to account for the regression-to-the-mean bias while normalizing for differences in traffic volume and crash frequency between the pre- and post-treatment periods is found in Hauer. (4,5) The expected accident frequency of similar intersections is determined using SPFs, which yield the predicted number of crashes at similar intersections. The value of the SPF (Nspf) is calculated for all sites for all study years. For this study, the period of interest was based on the crash data availability. On average, 5 years of pre-treatment crash data and more than 2 years of post-treatment crash data were acquired. The SPF was used to generate a prediction of the crash frequency for a site with the base conditions. All sites were at the base condition, and no modification factors were applied. Nspf was calculated for three- and four-legged stop-controlled intersections using equations 1 and 2. The SPF equations for total crashes were taken from the HSM. (3) In the case of fatal and injury crashes, the equations from Vogt and Bared were used. (6) The SPFs used in this study have not been calibrated to each of the five States because of a lack of data. Nspf = Estimate of intersection-related predicted average crash frequency for base conditions for three-legged stop-controlled intersections. AADTmaj = Entering AADT (vehicles per day) on the major road. AADTmin = Entering AADT (vehicles per day) on the minor road. The over dispersion factor (k) for this SPF is 0.54. (3) It provides an indication of the statistical reliability of the SPF. The closer the over dispersion factor is to zero, the more statistically reliable the SPF. Nspf = Estimate of intersection-related predicted average crash frequency for base conditions for four-legged stop-controlled intersections. AADTmaj = Estimate of intersection-related predicted average crash frequency for base conditions for four-legged stop-controlled intersections. Calculate the pre-treatment and post-treatment period crash frequencies, Np(before) and Np(after). A similar method was used to calculate a safety estimate for fatal/injury crashes with changes in the SPFs, which were taken from Vogt and Bared. (6) The reduction in crash rate for each site as a percentage is shown in table 5. Table 5. Predicted average annual crash frequencies. The following ideas may enhance future deployments of these treatments as presented by Bared et al. (2) Figure 6 and figure 7 illustrate the potential enhancements to the lane-narrowing concept for both rumble strip and rumble stripe designs, respectively. Figure 6. Illustration. Enhancements to section C of figure 3 with rumble strips. Figure 7. Illustration. Enhancements to section C of figure 3 with rumble stripes. The following section illustrates the lane-narrowing concept. The length of the narrowed section should be increased for the lane-narrowing concept. Currently, the design template shows a length of 150 ft for the narrowed section on the major approach. This length may be too short to achieve the desired effect. If the length is increased to 200 or 250 ft, then drivers will travel a greater distance in the narrowed section, which may induce lower speeds. While current speed reductions on the major approaches are statistically significant, there is an opportunity to further reduce driver speeds. The nearest area 50 ft from the intersection should not have rumble strips. In addition, a different rumble strip pattern should be used in the median. There are concerns that drivers may react similarly (i.e., steer to the left) when encountering both shoulder and centerline rumble strips with the same pattern. A recent study verified this concern and concluded that some drivers initially steered to the left when encountering centerline rumble strips. (7) Therefore, future deployments may consider the use of centerline rumble strips that produce a distinct sensation and noise to avoid confusion with shoulder rumble strips. Some States were concerned that 9-ft lanes were too narrow for the treatment section of the lane-narrowing concept. The American Association of State Highway and Transportation Officials publication, A Policy on Geometric Design of Highways and Streets, indicates that lane widths of 9–12 ft are generally used, and 12-ft lanes are predominant on most high-type highways. (8) One State indicated that it was required to submit a design exception to implement the lane-narrowing concept, while three other States indicated that they were not required to submit a design exception to install 9- or 10-ft lanes as part of the deployment of the lane-narrowing concept. For two-way, two-lane rural highways, wider lanes provide desirable clearance between heavy vehicles in opposite directions. (8) For the lane-narrowing concept, the presence of a painted median should provide adequate clearance for opposing vehicles, even with 9-ft lanes. For those States that would still prefer wider lanes, the pavement markings (i.e., center and edge lines) could be placed in the rumble strips to increase the lane width without changing the placement of the rumble strip. An alternative method for increasing the effective lane width is to use a wider edge line and place the shoulder rumble strips closer to the shoulder. Alternatively, rumble stripes create a vertical surface that provides enhanced visibility during nighttime and wet weather conditions. (9) However, the operational and safety benefits of rumble strips (pavement markings exist on the side of rumble strips) versus rumble stripes (pavement markings exist within the rumble strips) has yet to be determined. At this time, States could deploy either rumble strips or rumble stripes based on their typical applications. Furthermore, cross hatching in the median should also be provided for the lane-narrowing concept. Cross hatching will better define the presence and width of the median. In some of the deployments of the lane-narrowing concept, cross hatching was not used in the median. The treatment is much more conspicuous when cross hatching is used in the median (see figure 8 and figure 9). Figure 8. Photo. Cross hatching in median for better visibility of lane narrowing. Figure 9. Photo. Cross hatching in median at an intersection with left-turn bay. To further assist in the lane-narrowing concept, rumble strips along both sides of the median should be installed, and the installation of rumble strips across the entire width for narrow medians should be considered. Providing rumble strips across the entire median enhances the conspicuity of the treatment. A speed advisory plaque should be added to the warning sign (i.e., intersection ahead or lane narrowing) located prior to point 1 in figure 2. Data from North Carolina indicate that vehicles can travel up to 45 mi/h on highways with 9-ft lanes without crossing into the opposing lane. In areas where the posted speed is greater than 45 mi/h, it may be appropriate to provide a supplemental speed advisory plaque of 45 mi/h prior to the deployment of the lane-narrowing concept. It is also necessary to add signs to warn drivers of a speed limit reduction. The crash data from Kentucky and Missouri indicate that rear-end crashes increased after the implementation of the lane-narrowing concept. The intent of the lane-narrowing concept is to reduce speeds on the major road; however, this may create greater speed differentials and may increase the chance of rear-end crashes. Advance signing could help to mitigate this issue. It would also be helpful to install both W5-1 and W2-1 warning signs prior to the treatment. W5-1 signs indicate that the lane narrows, and W2-1 signs indicate that there is an intersection ahead. The use of one or the other does not convey both messages, so both signs are necessary. National Highway Traffic Safety Administration. (2009). Fatality Analysis Reporting System (FARS), Washington, DC. Obtained from: ftp://ftp.nhtsa.dot.gov/FARS/. Site last accessed September 2009. Bared, J., Hughes, W., Jagannathan, R., and Gross, F. (2008). Two Low Cost Safety Concepts for Two Way Stop Controlled, Rural Intersections on High Speed Two Lane, Two Way Roadways, Report No. FHWA-HRT-08-063, Federal Highway Administration, Washington, DC. AASHTO. (2009). Highway Safety Manual, 1st ed., American Association of State Highway and Transportation Officials, Washington, DC. Hauer, E. (1997). Observational Before-After Studies in Road Safety, Pergamon Press, Oxford, England. Abbess, C., Jarret, D., and Wright, C.C. (1981). "Accidents at Blackspots: Estimating the Effectiveness of Remedial Treatment, With Special Reference to the "Regression-to-the-Mean" Effect," Traffic Engineering and Control, 22(10), 535–542. Vogt, A. and Bared, J. (1998). 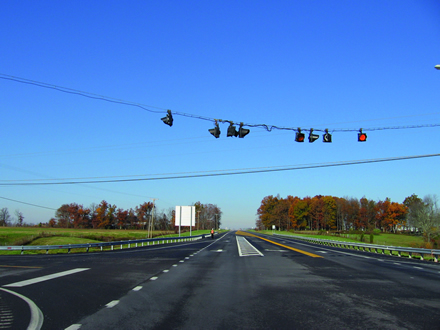 Accident Models for Two-Lane Rural Roads: Segments and Intersections, Report No. FHWA-RD-98-133, Federal Highway Administration, Washington, DC. Noyce, D. and Elango, V.V. (2004). "Safety Evaluation of Centerline Rumble Strips: Crash and Driver Behavior Analysis," Transportation Research Record 1862, 44–53, Transportation Research Board, Washington, DC. AASHTO. (2004). A Policy on Geometric Design of Highways and Streets, American Association of State Highway and Transportation Officials, Washington, DC. Transportation Research Board. (2009). "Guidance for the Design and Application of Shoulder and Centerline Rumble Strips," NCHRP Report 641, 22, National Cooperative Highway Research Program, Washington, DC. Researchers—Anand Asokan and Joe Bared authored this report. Ram Jagannathan and Warren Hughes were involved in creating the low-cost experimental designs, providing field implementations, and acquiring statistical crash data. The peer reviewers for this report were Ed Rice and Fred Ranck with FHWA, Dr. Shinya Kikuchi and Nopadon Kronprasert, and Mary Carolyn Thies of the Federal Aviation Administration. For information about this research contact Joe Bared, FHWA Project Manager, HRDS-05, (202) 493-3314, joe.bared@dot.gov. Distribution—This Summary Report is being distributed according to a standard distribution. Direct distribution is being made to the Divisions and Resource Center. Availability—This Summary Report may be obtained from the FHWA Product Distribution Center by e-mail to report.center@dot.gov, by fax to (814) 239-2156, by phone to (814) 239-1160, or online at https://www.fhwa.dot.gov/research/tfhrc/programs/safety/. Key Words—Speed reduction treatment, Intersection safety, and Lane narrowing. Notice—This Summary Report is disseminated under the sponsorship of the U.S. Department of Transportation in the interest of information exchange. The U.S. Government assumes no liability for the use of the information contained in this document. The U.S. Government does not endorse products or manufacturers. Trademarks or manufacturers' names appear in this report only because they are considered essential to the objective of the document. Quality Assurance Statement—The Federal Highway Administration (FHWA) provides high quality information to serve Government, industry, and the public in a manner that promotes public understanding. Standards and policies are used to ensure and maximize the quality, objectivity, utility, and integrity of its information. FHWA periodically reviews quality issues and adjusts its programs and processes to ensure continuous quality improvement.